South Adelaide have made it two wins from two games after recording an impressive victory over 2015 Grand Finalists Woodville-West Torrens on Sunday afternoon, running out 43 point winners. Another slow start from the Panthers had the Eagles looking ominous early, as the away side kicked the first four goals of the match. However, once Emmanuel Irra slotted South's first at the 15 minute mark of the first quarter the Panthers would outscore the visitors 14 goals to four and run out comfortable winners. Nathan Daniel was also key to South's success, collecting a team high 27 possessions and even drifting forward to get his name on the goalscorers list in the fourth quarter. South Adelaide now look forward to tackling 2015 Premiers at Hickinbotham Oval next Sunday (April 10) from 2:10pm. South Adelaide's reserves responded well to their disappointing Round One performance against Glenelg with a gritty performance against reigning Reserves Premiers Woodville-West Torrens on Sunday afternoon, but falling by two points. Positive signs from the match were the intensity the side brought to the game from the first bounce, rushing out to a two goal lead at quarter time and the resilience to not let the game get away from them even when Eagles took the ascendancy, with several lead changes in the final term. Meanwhile, Josh Trembath showed what he was capable up forward, kicking three goals in his debut for South. Best on the day was Pat Kerin, with 30 disposals and 10 marks, who started on the wing but was also impressive at centre halfback after Josh Giddings was ruled out of the contest with a head knock. Ben Heaslip responded well to his return to the reserves and impressed with the attitude he brought to the game and the 29 touches and 13 marks he collected on the day. New recruit Richard Newell (22 touches, nine marks, five clearances) continued to build on his form, while young talls Peter Steffe and Codey Ellison performed well both in the ruck and up forward. 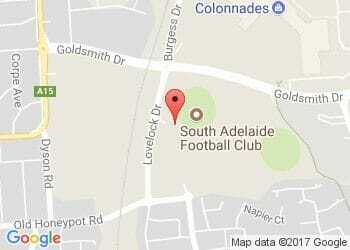 South's reserves next face West Adelaide at Hickinbotham Oval next Sunday (April 10) from 11:25am.